Three startups that were mentored at Technion made the short list of 10 finalists selected on October 24 to take part in the European Institute of Innovation and Technology (EIT) Food Venture Summit—the prestigious business gathering of the European Union’s agri-food innovation community. The startups, which include Jet-Eat and Kiinns, led by Technion alumni, will compete for three equity-free cash prizes of $68,000 each on November 28, 2108, at Station F in Paris. The third winning startup is Natufia. The finalists were nurtured in the EIT-Food Accelerator Network program, a collaboration of academic and corporate entities aimed at fostering innovation and entrepreneurship in food research. An EIT initiative, the program ran accelerators in Switzerland, Germany and in Israel, at Technion. Some 40 participating agri-food startups, poised to change the world’s food system, received mentoring from academics and international industry experts as well as tailored academic programs weekly sessions with business professionals, co-working spaces and networking opportunities. 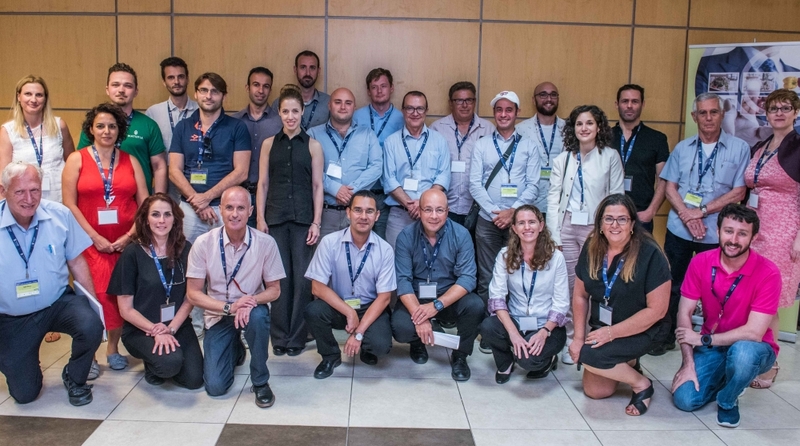 Ten startups took part in the accelerator program at Technion, which was a collaborative effort between the Faculty of Biotechnology and Food Engineering, headed by Prof. Marcelle Machluf, and the Strauss Group, whose CTO/VP of Technology is Dr. Eyal Shimoni. On behalf of the university’s administration, Prof. Wayne D. Kaplan, executive vice president for research and Prof. Boaz Golany, vice president for external relations and resource development are accompanying the accelerator. “This is a unique platform for entrepreneurs and early-stage start-ups to engage in a tailor-made accelerator program,” said Prof. Ester Segal at the start of the program in June. “We built a special curriculum for the food and agro arena and we provided informal access to the Technion faculty experts and its vast research infrastructure. We at Technion believe that we should take a proactive role in shaping the future of these fields.” Biotechnology and Food Engineering Profs. Segal and Uri Lesmes were joined by Dr. Avital Regev Siman-Tov, to lead the project. Jet-Eat is the first company in the world to develop 3D print technology for vegan meat substitutes. Statistics show that some $1.3 billion tons of food go to waste annually worldwide. The startup, based in Tel Aviv, aims to reduce food waste and provide innovative solutions to feed the growing world population by printing food. Kiinns has developed a patent-pending technology that eliminates the need to clean domestic and industrial food-processing equipment. The innovative tech turns standard kitchen devices, such as mixers and blenders, into smart appliances by installing a system that doesn’t require cleaning. Co-founded by father and son, Dr. Ehud Furman and Tzvika Furman, both Technion graduates, and based in Haifa, the unique technology saves time, water and energy, and significantly reduces food safety risks. His son, Tzvika Furman, added that the technology can also be adapted for paint, pharma, cosmetic and any other industry where surface cleaning is needed. Natufia, headquartered in Tallinn, Estonia, is a fully automated garden system for indoors designed by chefs for use in the home or the professional kitchen. The innovative hydroponic machine has a sleek modern design that fits into most kitchens and provides a direct supply of fresh herbs and greens all year round free of pesticides, herbicides and fertilizers. And it plays music too! Alkion BioInnovations SAS, based in France, has developed a new natural GMO-free and zero calorie substitute for sugar using plants and sustainable cost-effective biotechnologies. Phytoponics is an innovative patent-pending hydroponic growing system (a method of growing plants without soil in water-based, nutrient rich solution) developed by UK engineer Adam Dixon. Biofood Systems Ltd. developed a patented method to culture slaughter free real meat by using bovine embryonic stem cells. Ballis Natural Kitchen was founded by Inbal Gamliel following digestive problems she developed during her undergraduate studies at Ben Gurion University of the Negev. She makes sweet snacks that are not only tasty but nutritious. The Sprouted Grain Company, co-founded by couple Nili Badanovsky and Dan Moshe, aims to encourage healthy and wholesome eating by transforming basic staple foods into super foods through the power of sprouting. Soaking and sprouting are traditional, pre-industrial-era methods of food preparation. Avocadoo is a mobile application which guides users while shopping at the supermarket and helps them assemble a balanced healthy cart that is adapted to their personal tastes, budgets and health restrictions. The company’s goal is to harness the power of technology for healthy eating. Tryna Grub is a social dining platform for hungry foodies to arrange spontaneous meals with friends in an instant. It was developed by new Immigrants (Olim) Jared Blumenfeld, who made aliya at the age of 19 to serve in the IDF and Dr. Daniel Ayalon-Solares, who made aliya five years ago from Venezuela.